The gridlock’s already there, so the impetus towards alternatives to cars was obvious. But is it possible that Surrey’s density plans are reflective of trends in car ownership? Diane Watts has been asking for other options for some time now. In her state-of-the-city address last March, Watts said that current trends suggested a 50 per cent increase in car licences by 2040, but with only a 12 per cent increase in road bed. According to the U.S. Department of Transportation, just 28% of 16-year-olds and 45% of 17-year-olds had driver’s licences in 2010 (the most recent data available). In 1978, the corresponding figures were nearly half and more than two-thirds. A trend is in place, evidently. This past spring, the U.S. Federal Highway Administration (FHA) reported that the proportion of 14- to 34-year-olds without licences rose to 26% in 2010 from 21% in 2000. Research done by the Frontier Group and the U.S. PIRG Education Fund found that the use of public transportation by Americans between the ages of 16 and 34 climbed by 40% between 2001 and 2009. There are simply not going to be as many drivers in the future as there were in the past. The generation that is moving into prime adulthood simply does things differently from their parents and that trend should be matched by policy. For Surrey, it makes a whole lot of sense. 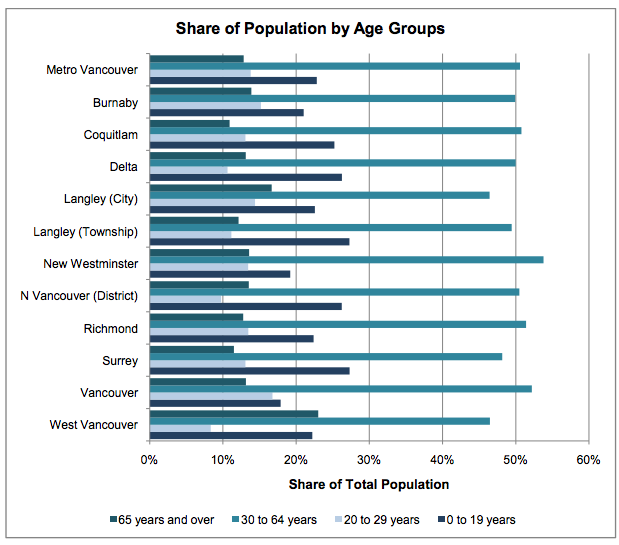 Looking at the number from the 2006 census, we see that Surrey had a large population advancing forward in age. Those are the baby boomers, whose car use, as mentioned above, is historically much higher than that of their children. 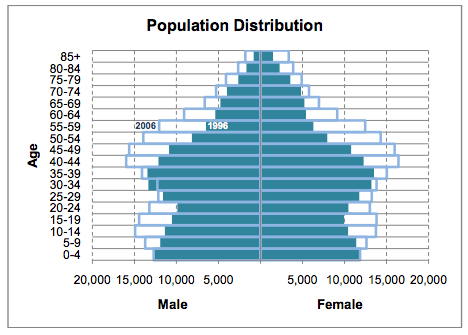 From the City of Surrey’s 2006 Census demographics report (pdf). See that bubble in the 20-24 range and below? Those are the young people we speak of. This is from six years ago, so the leading edge has entered their thirties and are having kids. Cost of living is a huge factor for them – if they can get by without a car, they’ll be supremely happy.